"The landscape in Guilin is the best under heaven", just as people say. Pick you up from your hotel in Shanghai by our private driver and transfer to airport. Take the flight to Shanghai. Our guide will pick you up at the arrival hall of Guilin airport. Free time for the rest of the day to refresh for our marvelous trip in the next days. After breakfast, you will head for Longsheng county to visit the Longji Terraced Filed. The terraces stretch layer upon layer from mountain foot to its summit, spanning vast area of about 16,308 acres. The views on the mountain top is awesome. Then pay a visit to the Zhuang and Yao Minority Tribes to experience the unique Chinese ethnic culture and see the suspension bridge in small size. 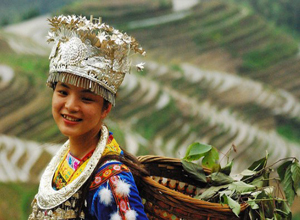 Transfer to Sanjiang county to experience the Dong people culture. Today you will take a Dong Minority tour to the Dong Village in Sanjiang. Situated at the foot of mountains and surrounded by rivers, Dong village features well-preserved residential houses and charming natural landscape. We will visit two landmark spots there-the Wind and Rain Bridge and the Drum Tower. The bridge reflects the Unique Dong style and the wisdom of the Dong people, by blending the styles of bridge, corridor and kiosk into a whole. The bridge was built as a shelter for the people who worked in fields, but later became a date place for the young people. The Drum Tower acts as the political and cultural center of the village. Every time when the chief of the village beats the drum, villagers will stop their work and get together around the tower. Return to Guilin for overnight. In the early morning take a cruise journey along Li River down to Yangshuo. This is the highlight of any trip in Guilin, providing picturesque scenery with peaks, crystal water, rice paddies and the background of blue sky and white cloud. After a 4 hour sailing, arrive at Yangshuo old county. We will visit the historical West Street, which is now called ‘Foreigners’ Street’ because of the large number of foreign residents here who also open bars, restaurants and shops in the street. Then we do a biking tour to explore the countryside of Yangshuo. Free day for you to explore the small town of Yangshuo. You are suggested to visit the famous Moon Hill and the Big Banyan Tree. The Moon Hill is so named for a wide, semicircular hole through the hill. Climbing to the arch of the hill is a popular activity, taking roughly 20 minutes. The Big Banyan Tree is 1,500 years old, like a giant green umbrella providing a natural shelter for passers-by. The West Street is a good place for nightlife. Return to Guilin and have a city tour to three famous attractions. The Reed Flute Cave is known as the Palace of Nature Arts. You will see various shapes of stalagmites and stalactites like flowers, birds, curtains and animals. Proceed to the Elephant Trunk Hill, regarded as the symbol of Guilin, resembling a giant elephant. The last stop is Fubo Hill, featuring beautiful landscape, numerous historical items and stone carvings. After the tour, transfer you to airport and fly back to Shanghai. Pick you up from Shanghai airport and transfer to hotel. End of our service and thank you for using our service. *Hotel charges in Guilin, Sanjiang and Yangshuo. *China internal flight: Shanghai-Guilin, Guilin-Shanghai. I am interested in doing the 6 day trip to Guilin, traveling from May 25. What would be the price for a single person, including roundtrip flight from Shanghai to Guilin? We have sent an email to you, please check. Thank you! I am interested in doing the 6 day trip to Guilin, traveling from May 25. What would be the price for a 3 persons, including roundtrip flight from Shanghai to Guilin?